The Fondació Tàpies occupies one of the more striking business buildings around the Passeig de Gràcia: the Editorial Montaner i Simón (1880–5) built by Domènech i Montaner for his publisher brother. It was the first time that Domènech had a chance to put his proto-Modernista theories into practice in the good Catalan brick and iron he loved, arranged in patterns reminiscent of the Moorish-influenced mudéjar work of medieval Spain. 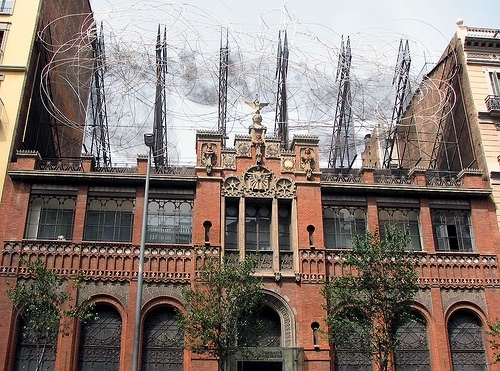 Antoni Tàpies, whose poetic smudges and scribbles made him a world-famous artist, took over the building for his foundation and topped it all with his Núvol i Cadira (Cloud and Chair) that hovers over the building like a giant bird net. The pigeons have learned to avoid it. Born in 1923 to a bourgeois family in Barcelona Antoni Tàpies was a sickly child who spent days in bed, sketching. His father compelled him to study law (he survived school better than his good friend Joan Miró), but he returned seriously to his first love, art, during the Second World War. Initially he flirted with Surrealism before turning to abstract works and joining the avant-garde Dau al Set group. After its dissolution in 1953, came into his own as one of Spain's most influential artists—in 2010 King Juan Carlos raised him (like Dalí before him) into the Spanish nobility: he is now the Marquès de Tàpies. Like Miró, Tapiès seeks the extraordinary within the ordinary, often with a glance over his shoulder to his childhood in old Barcelona—the graffitied walls, the mirrors and wardrobes of a young invalid. His art, often bleak and yet spiritual (he has had a lifelong interest in Buddhism), were created from found objects, scraps of paper and rags, and sprayed with clay and grit. Few artists have more deeply explored the emotional impact of everyday textures and gestures. In 1984 he set up this foundation for the study of contemporary and non-Western art. His own art is arranged upstairs, while the lower level is dedicated to changing exhibitions of other people’s—keep an eye peeled; some of the shows are exceptional.